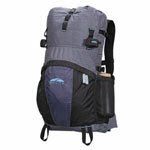 Here is our current gear list for our ultra-light backpacking adventures. Our system is designed for 2 people, we get weight saving by sharing. A solo kit would be very different. Most items have a review associated, click on the link for more details. The weights listed are my own measurements, not off the label. Brett's personal items and clothing. Theresas clothing and personal items. This table shows all of the gear we use for carrying or sleeping. All of our basic cooking gear is listed here. Small plastic tub of sea salt, white pepper and red thai chili powder. Random other stuff that is essential on the trail. A good old kitchen trash bag to protect your gear from saturation. Key First Aid Items in a zip lock bag. Spare for the Photon Freedoms. Cheap insurance. Small portion in a 1/4 oz. plastic container from REI. Write messages home to mum. Base weight of our packs before adding food or water. This is the constant weight that will never vary. This table shows our final weights once loaded with Food & Water at the start of the trip.